ASN celebrates National Volunteer Week! National Volunteer Week (NVW) is a time to celebrate and thank Canada’s 12.7 million volunteers. ASN's volunteers are the key to the success of our programs.. Without their passion for science and engineering, and enthusiasm to share it with students and their teachers we would not be able to reach out to students and to inspire them about science. Each day this week a new profile will be added to our volunteer profiles page - please check to read about some of the amazing people who volunteer with us! Thank you to all ASN volunteers for all that you do! Calling APEGA members - The Association of Professional Engineers and Geoscientists of Alberta (APEGA) is looking for former and current professionals to complete a brief survey on workplace culture. Please take a few minutes to share your perspectives, and share this with your network. At the end of the survey, you will have an opportunity to enter to win one of three $100 Visa gift cards! Our next Calgary charity casino will be on Thursday April 11 and Friday April 12 at Cowboy’s Casino, Calgary. For more information or to volunteer for this important fundraiser please contact Ed Kusmirski, Casino Chairperson. Our fall newsletter is online! 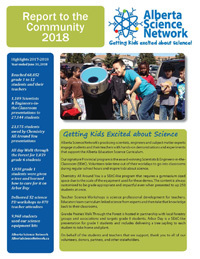 Find out what's new with ASN and how you can help us get kids excited about science! And there's information about upcoming Teacher Workshops and other news.. Please use the subscribe link to make sure you receive future newsletters (just 2-3 per year). We are pleased to share our Report to the Community for the year ended June 2018. Please read what we have accomplished this year and spread the word about how ASN gets kids excited about science! Elaine has been volunteering with ASN in Edmonton since May 2016. She has done 18 classroom presentations to over 420 students. She presents Grade 4 Plant Growth and Changes and Grade 6 Trees and Forests. Thank you Elaine! National Volunteer Week is when we take time to recognize, celebrate and thank Canada’s volunteers. At ASN we acknowledge that volunteers are essential to all that we do. It is their passion for science and engineering, and enthusiasm to share it with students and their teachers that helps us get kids excited about science. ASN would like to acknowledge the generous contribution of Pratt & Whitney Canada for its support of our Scientists & Engineers-in-the-Classroom program in the Lethbridge region. This donation will allow ASN volunteers in SW Alberta to purchase supplies and equipment to enhance their in-classroom presentations. With this funding from Pratt & Whitney Canada, ASN will get more kids excited about science! Thank you. ASN’s next Calgary charity casino is Thursday April 11 and Friday April 12 at Cowboy’s Casino. Contact Ed Kusmirski if you can volunteer for a shift or two.